I would love to learn to can. I told my mother I wanted to can tomatoes and she busted out laughing. There really is something special about the old ways. It’s definitely a lost art! It’s completely worth it though! Everything I’ve read about canning tomatoes notes to use lemon juice or citric acid in each jar to ensure high enough acids levels, especially when water bath canning, due to so much variety in each tomato from breed, water during growing season, etc. This is just my 2nd year canning….I’m a nervous canner! I was taught to can by a lovely, elderly woman. She taught me how to can the same way she was taught many years ago. She really took the intimidation and “canning fear” out of canning tomatoes. This was her process. But if you want to add acid, go for it! No worries and confident canning! To date, I´m a sweet stuff canner, usually preserving fruit, but canning tomatoes might be a good idea to widen my canning horizon! Thanks! So glad this post inspired you! I use canned tomatoes so much for so many different recipes, and using my own really elevates each recipe! Have a lovely day! Thanks so much for the sweet words! Hope you have a lovely time canning! This is so interesting! I never thought you could preserve tomatoes without using vinegar, sugar, salt or any of those conservatives. How long can you keep them like this? I’m sort of afraid the air in the jars or freshness of the tomatoes won’t make them last very long, but I’m really intrigued to try! I was taught by an older Italian woman that’s been doing this since she was a little girl! This approach is incredibly simple and straightforward. She let me know they would last all year, until the next tomato season in a cool, dry place. I tried to fill my jars up as much as I could without overloading the jars. Hope this helps! Great recipe, thank you so much! I recently came across your blog and it is both beautiful and wonderful! That being said, many people (including myself) continue to use old canning recipes handed down from family members. As someone who has canned for years and keeps up-to-date on safety regulations regarding the practice, my only concern is that you have not put any kind of warning on this non-recipe recipe. 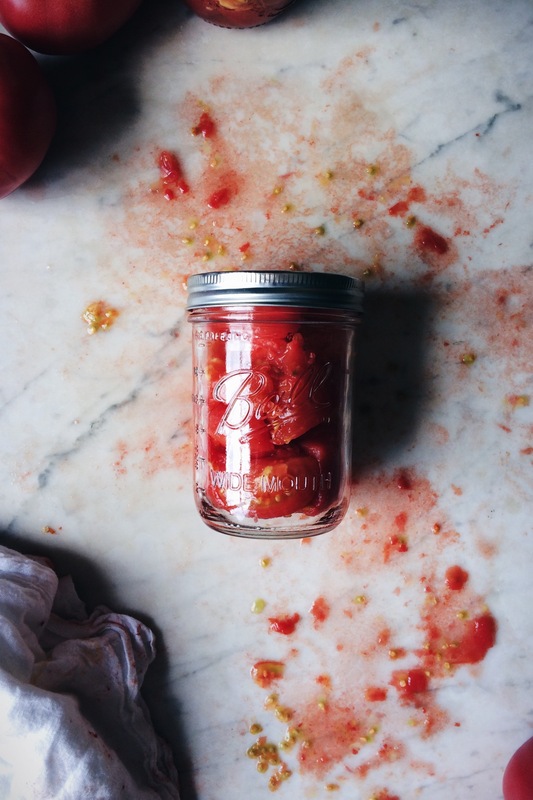 Canning and preserving is very serious and while you may keep a clean kitchen, some do not. It is important to refer readers to the National Center for Home Food Preservation site for questions regarding acidity and safety… botulism is very real. 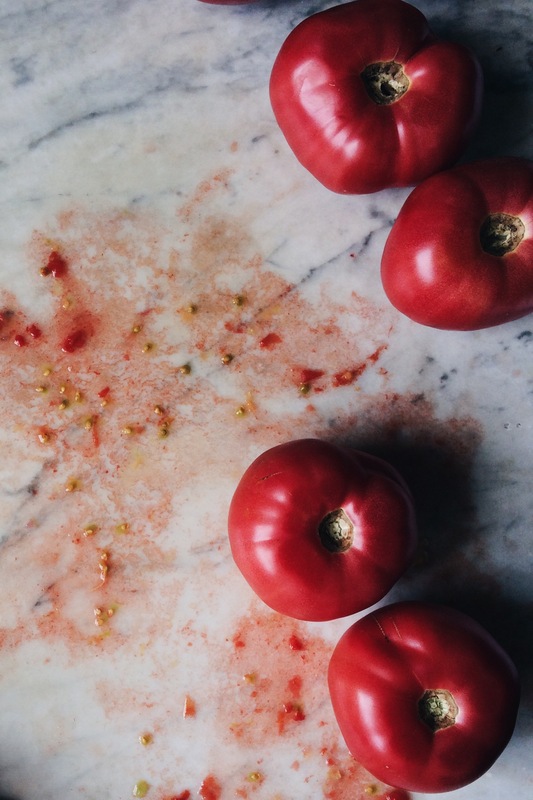 Additionally, (and particularly important for this post) many varieties of tomatoes in today’s age are not as acidic as past varieties available to our grandparents and some acid needs to be added to the jar. Thanks so much for the concern! One of the reasons I have tackled canning just now is because I was shown how in a very simple way (and also, I’ve had so much fear because of horror stories I’ve heard of canning). 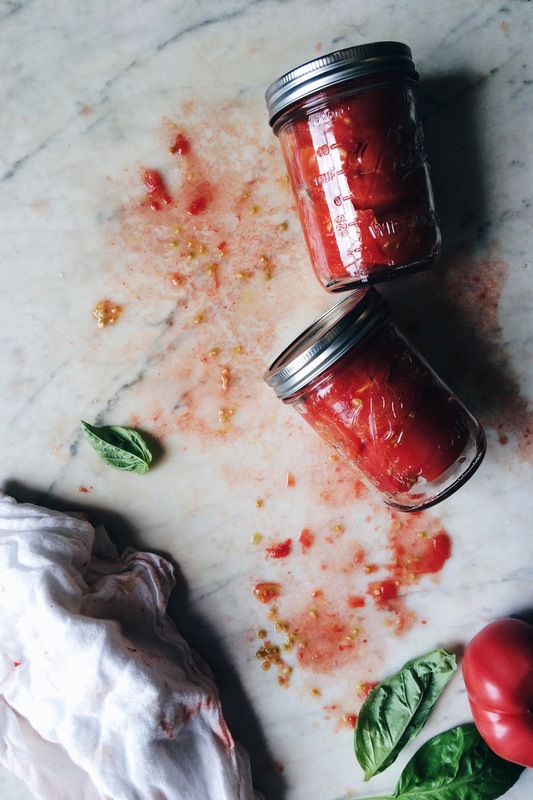 I was taught to start with a clean space, making sure to sterilize all jars and lids properly and getting my hands on the best, local, organic tomatoes possible. But if someone is not able to stick to one of these three rules, they need to purchase their canned tomatoes at the market! Just like learning and respecting the handling of raw poultry and properly cooking meat, canning in the kitchen should be given the same attention and respect! Thanks so much for sharing the very real concerns in home canning!